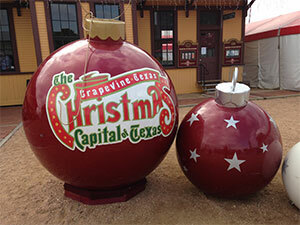 A few months back my wife suggested we kick the holiday season off by traveling to a festive place in the U.S. After checking our list twice (maybe more) we decided on the Christmas capital of Texas … Grapevine. Before I go on, as suggested in prior articles, when you have the opportunity to check in 24 hours in advance, I encourage you to look at the upgrades your airline may have available. For a mere $162.00 each we upgraded to first class seats with American Airlines. Our flight was early afternoon the Wednesday before Thanksgiving Day. Oddly, enough SJC airport travel was light. Our accommodations were at the Marriott Gaylord Texan Resort Hotel. 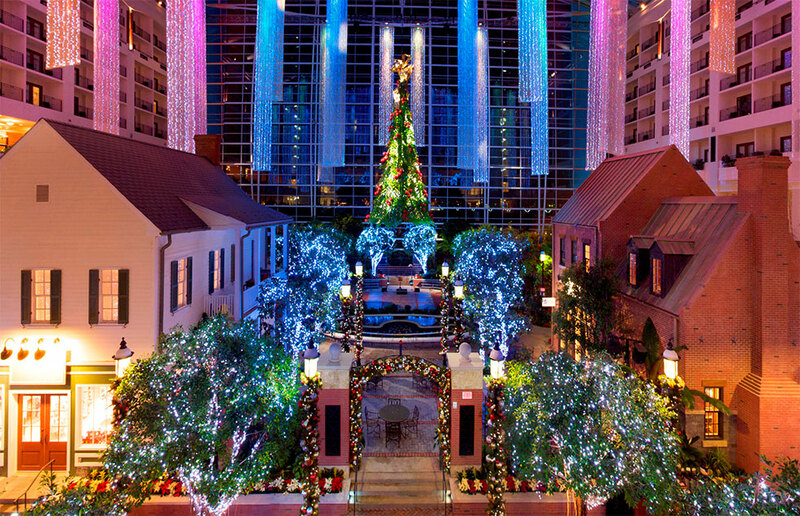 We only need to walk around this massive hotel to experience the magic of Christmas from around the world. 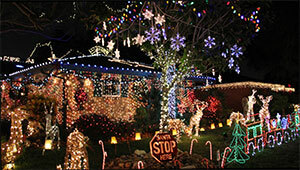 Christmas displays that include more than 2 million twinkling lights and acres of larger-than-life decorations. There are many events going on daily and nightly at the hotel. This is great family fun, some that you may want to check out. Cultural traditions from around the world featuring holiday scenes and children from Mexico, Germany and other countries. There’s a two-story tall ice slides, an enchanting Parade of Toys and larger-than-life ornaments. How about traveling through the North Pole and sit inside Santa’s sleigh. Experience the Frostbite Factory – an interactive ice carving station. A full nativity scene in stunning, crystal clear ice Finally your experience concludes with a specialty alcoholic drink at the ICE BAR. One night for dinner we dined at the hotels Old Hickory Steakhouse. They offer quite a selection on their menu, with selections of Steak, Pork and Fish. 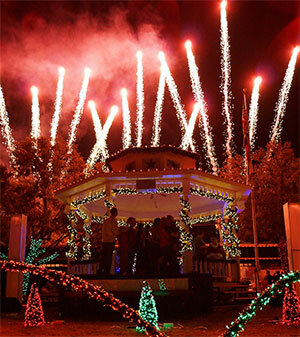 The town of Grapevine is filled with festive boutique shops and tasty restaurants. After strolling the shops, you can climb on board the North Pole Express train. I suggest making reservations to this popular event weeks in advance as- it’s the place to be - and many Texans travel with their families every year to climb on board. The experience begins at the Historic Cotton Belt Depot platform where riders board the beautifully decorated Victorian Rail coaches. As the train departs and the anticipation of arriving at the North Pole builds, elves will welcome the guests and sing traditional Christmas music. Then, a magical moment! As the train draws closer to the North Pole, Mrs. Claus makes a special appearance to give each child a “We Believe” silver Santa bell. Guests then arrive at the North Pole and walk along a snowy Christmas tree trail, where, as they wait for an appearance by Santa, guests are entertained with songs and magical Christmas moments. Finally, Santa arrives! Santa wishes everyone a Merry Christmas and then shares his Frosty Chocolate Snow Milk served in a memory mug to all the boys and girls. Families will also receive a voucher for a complimentary Family Photo with Santa. It was a great trip with lots of fun in Grapevine a little town with a lot of holiday spirit!